This guest blog by Kimberly Guise, Curator at The National WWII Museum, and the video included therein was produced as part of The National WWII Museum’s participation in the Smithsonian Lemelson Center for the Study of Invention and Innovations’ Places of Invention Affiliates Project. Places of Invention is made possible in part by a generous grant from the National Science Foundation. World War II brought about unprecedented needs for both manpower and material. An arsenal of ideas became a necessary component in building the “Arsenal of Democracy.” The founding of the National WWII Museum in New Orleans is closely tied to the legacy of Higgins Industries and the landing craft that made the Allied amphibious invasions of World War II possible. Figures like the LCVP’s creator Andrew Jackson Higgins, who solved problems and created new and more efficient ways to operate, along with the millions of workers who brought these ideas to life, were vital factors in American victory. The August 16, 1943 issue of LIFE Magazine featured a large spread on Higgins, founder of Higgins Industries of New Orleans. The article chronicles his professional development beginning with the story of an Omaha boy of 12, who literally thought outside of the box. The young Andrew Higgins built a boat in his house that was so large that part of the house had to be torn down to free it. At least he named the boat after his mother, calling her the Annie O. In order to expand immediately and meet the wartime demands, Higgins used unusual tactics, like listening to workers. He employed a think tank of designers and engineers that he called his “stable of geniuses,” but also put suggestion boxes on the factory floor so any employee could recommend innovations to streamline production. His progressive approach kept worker morale high, contributing to the company’s outstanding production rate of more than 700 boats per month. Higgins wasn’t the first or the only manufacturer to turn to the factory floor for ideas. A popular slogan was “Ideas win the war!” The special STEM (Science, Technology, Engineering, Math) field trip for middle and high school students at The National WWII Museum focuses on science and technology of WWII and centers on creating innovative solutions to some of the complex problems America faced during WWII. Armed with data sheets, calculators, and their own creativity, students improve WWII vehicles, calculate firing trajectories, crack a secret code, determine the rate of bacterial growth in an infected battlefield wound, and even figure out how much wool is needed to clothe an army of 16 million soldiers. 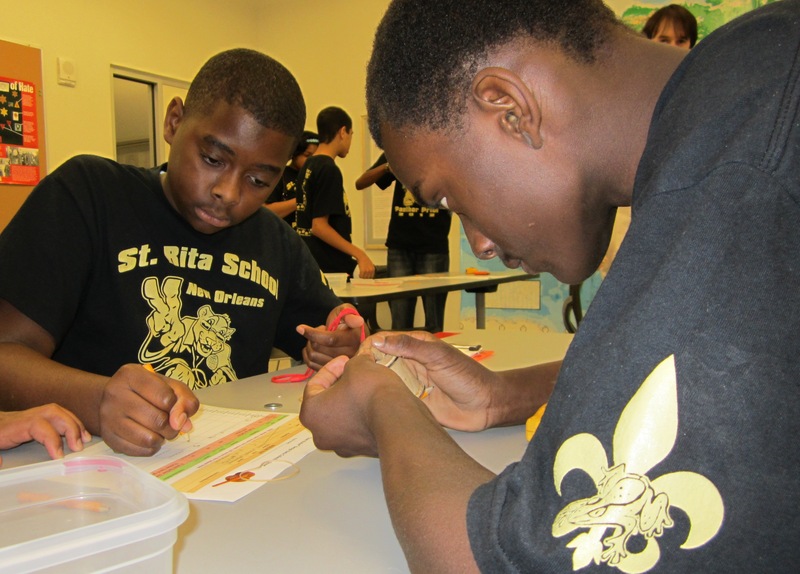 They then enter a design competition where their skills in creativity, teamwork, and data evaluation are put to the test. 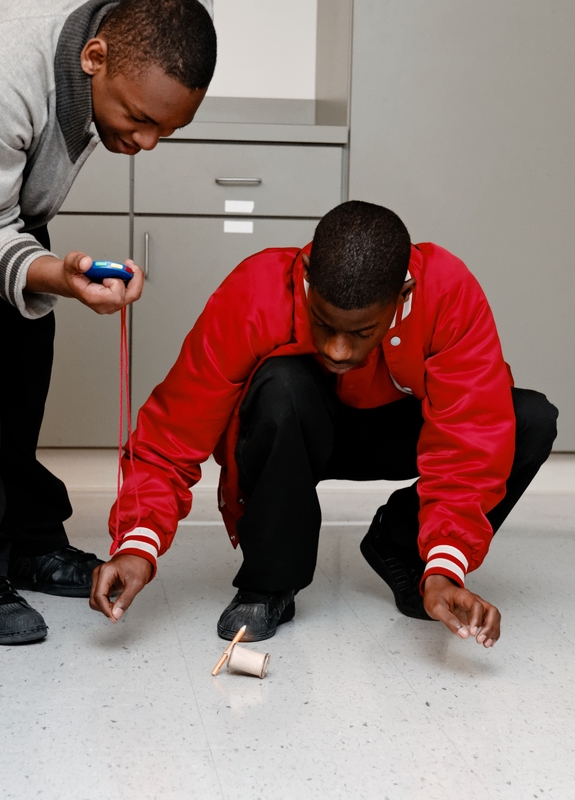 Responding to an RFP, students compete for a contract to create a simple vehicle that can perform specified tasks. Winning designs are “awarded” the contract. In this way we foster the legacy of innovation and honor visionaries like Andrew Jackson Higgins. 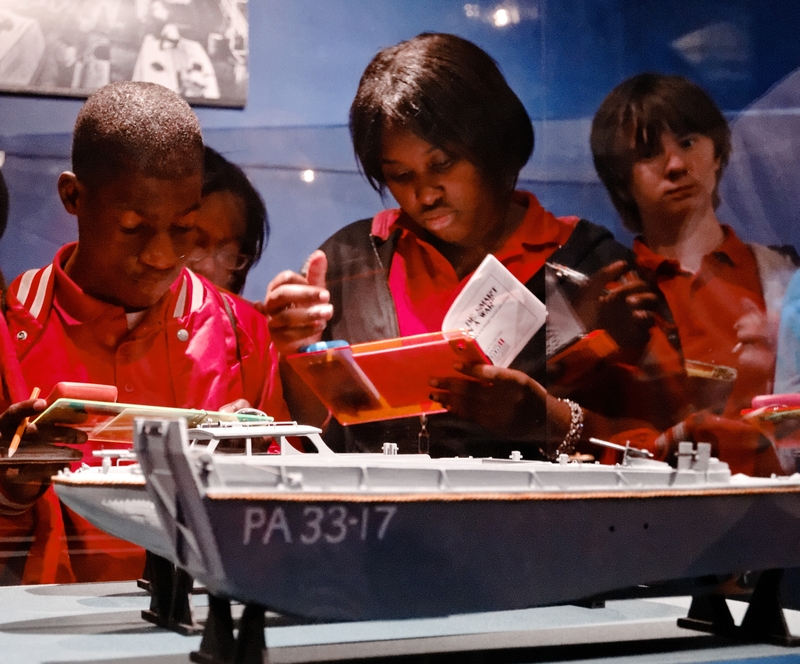 Students during The National WWII Museum’s STEM Field Trip. Courtesy of The National WWII Museum. To learn more about the contributions of Higgins Industries and about the American Experience in WWII visit The National WWII Museum.